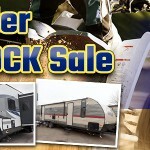 Huge Savings at Our Toy Hauler Overstock Sale! Don’t Miss Our New and Used Truck Campers for Sale! 100th Anniversary Sale: Brand New RVs at Unbeatable Prices! Forest River Patriot Edition RV Review: Customize This Travel Trailer for the Perfect Vacation! Forest River Cherokee Ice Cave Review: Your Best Fishing Trip Awaits!